I took some of my birthday money and bought myself a present. I have a small addiction to these great pieces from Paula McCullough at PaulaArt. This one came and it was even better than I thought it would be. A beautiful bright blue and the marks on it were really special. It even had a dent -all scritchy, scratchy and scraped where the dent was. I just loved it and want to get some flowers for it next. Go check her out with her three different etsy shops. I have never been disappointed in what I have received! I am working but just not on something I can show you yet. Also, recuperating from the end of year school stuff and trying to process things. Trying to weed out what techniques I want to work on and incorporate into some pieces and what I want to let go of -for now. It’s summer, after all. This entry was posted in Paula McCullough on June 14, 2011 by Colleen Kole. Every once in awhile, you need a treat. And the ones I really enjoy are the treats that people have made. The art that they have made is even better. I ordered two things for my little table here in VT. I am always losing my four most important tools on my table- I am messy but once I get started I don’t want to stop to look for things. 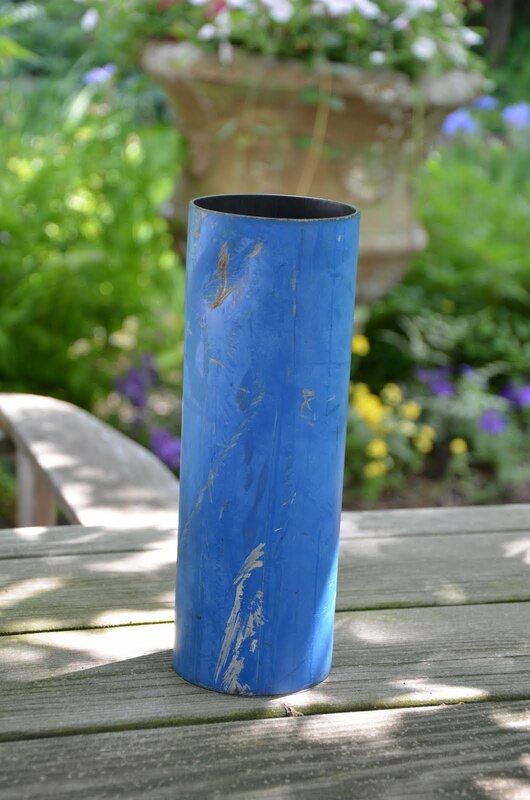 So I ordered this recycled pipe vase from my new friend Paula. I have never personally met Paula-but she has been a great help to me. I love it. 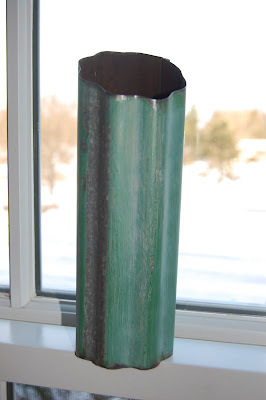 It is smoothly polished yet it retains all of it’s chips and worn spots to give it lots of character. In the past 48 hours of marathon sewing at night, it is trustworthy for containing my mess. Love it. 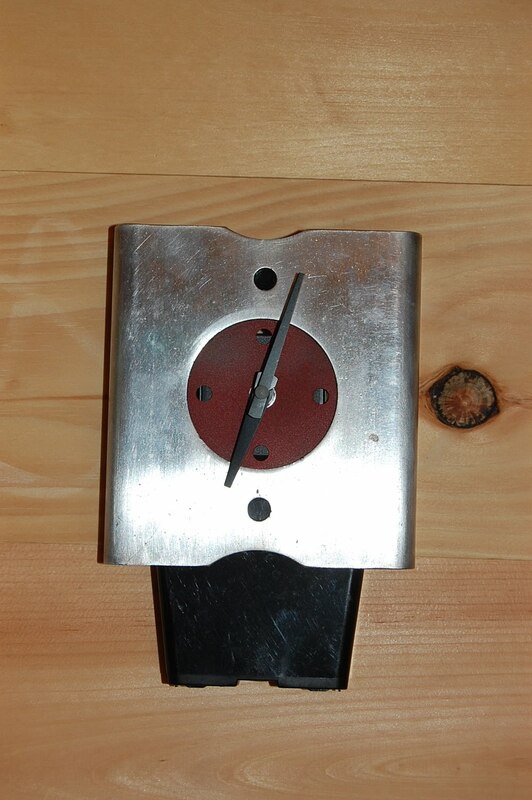 My other absolute treasure is this little clock. It has a temporary home in my barn while I work on dyeing and surface design. It keeps me on track when I get carried away at night. But most importantly, it just makes me smile. I am the proud owner of a Paula clock. I had my eye on this one for awhile and finally did it. Smiling, I am and it’s perfect. Not a great picture but I wanted to tell you about it as Paula is auctioning off a few of her clocks on e-bay. Just a few so go find out about her art. It all began with friend of her’s who handed me a card. Thanks Paula for the inspiration. And the great new art I have purchased. 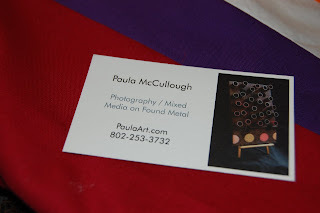 This entry was posted in inspiration, Paula McCullough on July 14, 2010 by Colleen Kole. I need to tell you a story-it’s long but dear to my heart and fits with my Vermont home. When we go to VT, we fly into Burlington and hire a taxi service to drive us to our home. About 4 years ago, we met the nicest guy tod who was the driver we always requested. Really nice guy who always had interesting conversation for us-no matter what time of the night it was or how late our flight was-we always enjoyed him. Two years ago at Christmas, he asked me what I did in VT if I didn’t ski and I said that I did contemporary art quilting. 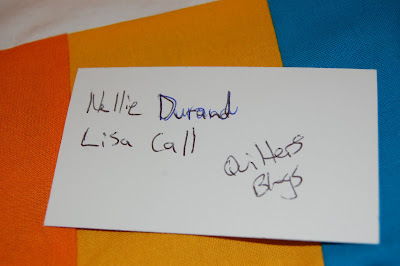 He handed me a card with his girlfriend’s name and two other quilters names. I still have the card. His girlfriend Paula is an artist and knew some textile artists. I took the card and put it away for a few months. I ran across it later and looked up the names. I was amazed and enthralled at this world of textile artists that I never knew existed. 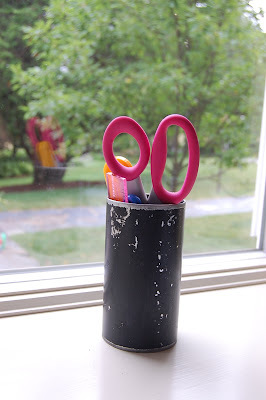 I had taken a Nancy Crow class but didn’t know how it fit with what I did. The more I looked at others works, the more I was amazed. I wanted to be part of this wonderful world -no matter how small or insignificant-and started taking classes to take traditional quilting to a different path. The textile artist path…the beginning of something different. Paula and tod have moved on to new and exciting things with the Phoenix Commotion. You can still find her on Etsy-her clocks are too cool. I regret not taking the time to meet her earlier. But I love that we can keep in contact via e-amil. Thanks for the inspiration, Paula. Must run to actually sew again. Happy Sewing, my friends. This entry was posted in Nellie Durand, Paula McCullough on January 6, 2010 by Colleen Kole.